I guess it goes without saying that I've been really, really busy this summer. You may notice that I've been active on Pinterest and Facebook, but I haven't been as active on the blog as in the past. I've been cooking and baking, but I've also been working, taking care of Max, and we've been settling into our new home. Despite the chaos and excitement, I'm still finding time to cook, especially on weekends. I've always loved cooking breakfast and I find that rich, heavy meals are best served in moderation (Saturdays and Sundays only). I also love that eating a great breakfast gives me fuel to do whatever we need to pack into our weekends. Normally a big breakfast means we'll only eat two meals in a day. I grew up eating corn fritters. My mom tells me that her mom made them for her. I never met my maternal grandmother (she passed away long before I was born), but I remember my mom mixing up corn fritters for us since forever. She used a boxed pancake mix and until recently I did, too. Now, however, I've modified my favorite scratch pancake recipe to create our family favorite: buttermilk corn fritters. 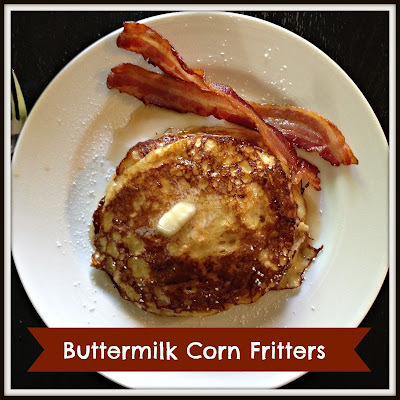 When I was dating my husband I think he may have found it strange that we put corn in our pancakes and called them "fritters". There's another type of corn fitter out there, but it's more of a fried little nugget of cornmeal and whole corn kernels. This isn't that. This is a fluffy, moist buttermilk pancake that is enhanced with creamed corn. It may sound a bit odd, but it's so good! Good enough to make you look forward to getting up at 6:30 am on a Sunday when your baby wakes you up with "dadadadada". Good enough to make your mom drive to your house to bring you bacon at 7:15 am (because you ran out) just so the family can have the perfect breakfast. Yes, they are that good. I hope you enjoy one of my favorite breakfasts. Sift together flour, sugar, baking powder, baking soda and salt. Whisk together eggs, milk, buttermilk, vanilla and butter. Keep wet and dry ingredients separate until you are ready to make your pancakes. Gently combine wet and dry ingredients (do not overmix!) by hand. Gently stir in creamed corn. Preheat griddle to medium heat. Ladle pancakes onto griddle and cook until done. This batter is thick, so it will take a few minutes longer than thinner recipes. Mine take about 3-4 minutes per side. I preheat my oven to 200 degrees to keep the pancakes warm until I am ready to serve the entire batch. Serve hot with butter and syrup and enjoy! Sounds yummy and so unique. I never would have thought to add creamed corn. creamed corn in pancakes does sound strange. but these look delicious, and I have to pack in all my american breakfast foods in the next 4 weeks! yum! Oh yum!! This looks so good :) I can't wait to get this on my plate!